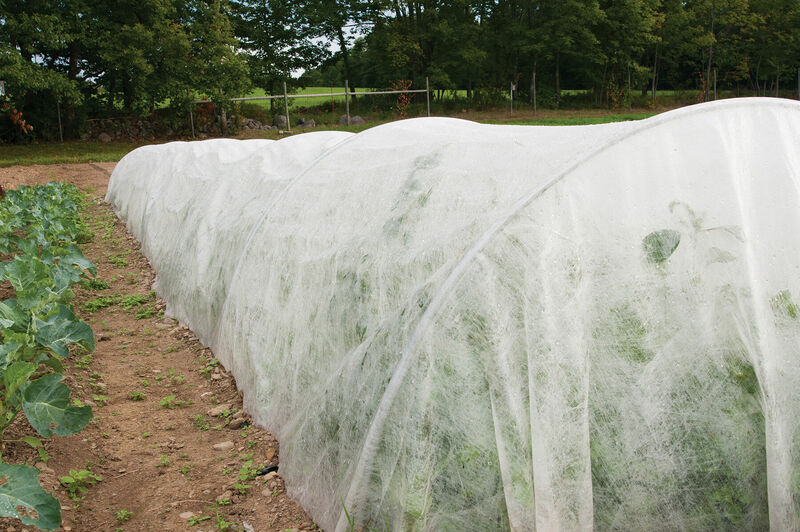 You can't often tell what's growing under a protective shield, but usually, it is plants like broccoli growing under what's called a row cover for a very good reason. And these row covers are a very fine spun poly material that would allow water and 90% of light to go through. And the reason these types of plants including broccoli are grown under row covers is that, when you have a physical cover over it, the rabbits can't get under there, the deer can't get under there, and also the little white butterflies that like to lay the eggs and give you little green worms that eat up your broccoli cant get in there. You could really be too crazy about broccoli that have worms floating in it, so you might as well use a row cover. They can be used for multiple years if you are careful with them, and the thing that you want to remember when you're going to put a plant under a row cover is that, plants will get larger, so the row cover has to be very loose so that it will expand as the plant grows. If you have a few weeds that are growing, normally what you would like to do when the plants get up large enough is that, go through to doing one final weeding, and then put down a heavy mulch of straw so that you don't have to deal with the weed problem. You might also like to just put some coffee down there, you can use coffee grounds as long as there's some caffeine in it, and if slugs eat that, that will kill them, so you don't have to worry about slugs either. So, it's a really great way to grow broccoli with no insects on it without spraying with the use of protective row covers.